Quality is a form of management that is composed of the double approach of driving an organization towards excellence, while conforming to established standards and laws. The objective of quality confers advantages to companies: it makes them more resilient to change that can be unexpected or even chaotic; it makes them more competitive by identifying those steps in processes that do not offer added value. No longer the concern of a small community of experts, even scientists and engineers working in the private sector will find that they will have to con- front questions related to quality management in their day-to-day professional lives. 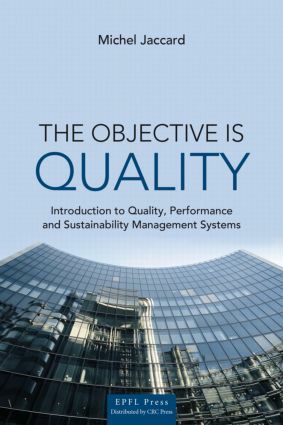 This volume offers such people an unique entry into the universe of quality management, providing not only a cartography of quality standards and their modes of application – with particular attention to the ISO standards – but also a broader cultural context, with chapters on the history, prizes, deontology and moral implications of systems of quality management. This book thus opens the door to all those eager to take the first steps to learning how the principles of quality are organized today, and how they can be applied to his or her own activity. Michel Jaccard is a physicist (Ph.D. in biophysics from the University of Lausanne) who has worked as R&D project leader at Nestlé and as a member of the direction of a large food corporation before joining the direction of the Ecole polytechnique fédérale de Lausanne (EPFL) in 1995. In this role, he has been director of academic affairs of EPFL; head of communications for the Board of Polytechnic Institutes (Zurich); and head of quality at the EPFL. In 2009, he was named director of International Affairs and Accreditation of the EPFL, and he is also Senior lecturer at the EPFL College of Management.